Toffee Apples are a wholesome, healthy and exciting snack! ... or just for some added excitement as a special treat. Our standard is a hand made toffee apple wrapped in a clear cellophane and sealed with a gold twisty. Standard labelling with production information, ingredient & allergen declarations. We can personalise the bottom label to match themes, invitations & company logo's. Go that extra touch and have your Toffee Apple personalised to match your event theme with custom ribbon. This is our party option and can be your thank you gifts or the new lolly bag for your kids next birthday party. 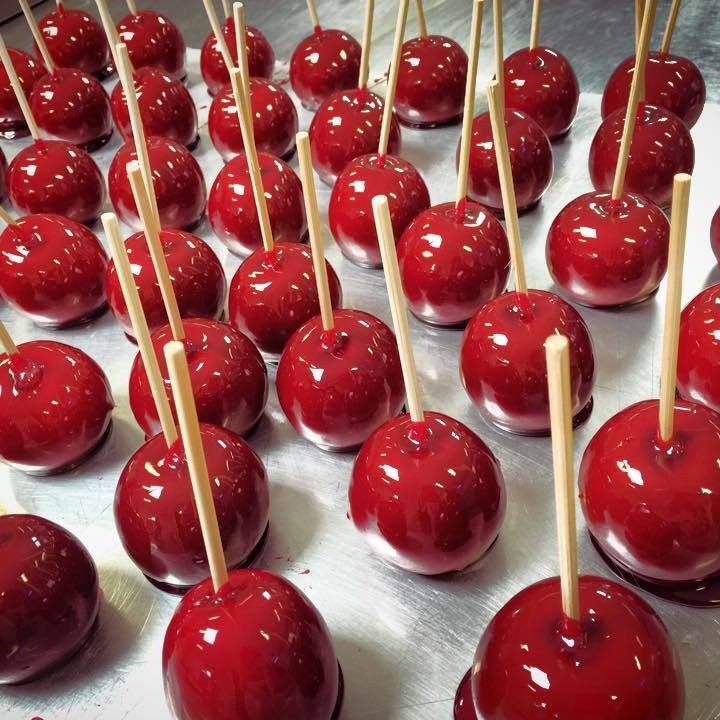 We produce red & green toffee apples daily to order. Available for pre-orders of 15, 18, 20 or more. Black toffee apples used for Halloween treats. Celebrate birthdays the fun and exciting way. Toffee Apples are not only an attractive visual display but a treat for young and old. Send something a little different, the gift of a Toffee Apple pack. Sumptuous and exciting. What an elegant and stylish way to do something different. Talk to us about creating something extra special for your big day. Your guests will be delighted. Allow us to create a function with a distinct attraction, either as table settings or a display. There is no limit to our imagination. Our designer Toffee Apples can be utilised for marketing promotions. Advertising campaigns, product launches and as props for photographic shoots. Pick up must be arranged prior to collection, Pick up is available from Monday - Saturday 9am - 2pm. We use Australia Post to provide Express Shipping to available areas. Delivery charges are estimated on the quantity and the destination post code. All order's for delivery must be made in multiples of 15, 18 or 20. We ship Australia wide, excluding WA. Email to enquire for delivery costs.